Off the centre of the 11ain Street, this road passed through Colonel Fitzustace Foster's demesne. On the corner of the entrance to the Lane was a high ten foot wall bounding the Colonel's mansion, Swords House. [ where Fingal County Council Offices Are Today ] On the corner fronting the main Street was a big double leaved bronze gate in ornamented design of metal tracing. It was ten feet high and about twelve or fourteen feet wide. Inside the gates was a picturesque lodge with Gothic lattice-paned windows. There was a curved short avenue leading to a four storey mansion in brick, faced with white cut stone. There were steps leading up to the front door and an area basernt surrounding the ground floor. it was a large square building with at least thirty or forty rooms. The grounds were planted with ornamental flowers and shrubs and a grove of evergreen Irish oak fronting the boundary wall on the lain Street. . ll the demesne was planted with shrubberies and forest trees including a large walled in orchard and garden and elaborate stables and farm buildings at the back, some distance from the house. In the other corner of the Lane entrance, there was a harness maker's workshop, a low two storey house with a very large window on the ground floor. This window had a wide sill about a foot off the ground, which was a famous resting place for out of work labourers and other loiterers. The harness maker had his bench all along the inside of the window where he plied his needles on the harness and had a corialete view of all that happened in the main Street, as he faced the window from his seat in the middle of the bench. He was lame in the legs as a result of some illness, but was a very intelligent and interesting character. He could relate stories and tales, took a keen interest in the politics of the John Redmond Home Rule Party, had some conjuring tricks which he displayed to mystify the young boys who were privileged to enter his workshop. Many discussions and debates took place around his bench while he plied his needles in the leather. There was a big pile of straw in one corner of the shop which he used to stuff head collars and straddles with, and an odd out of work labourer was allowed to have a nap there on occasions. On Sundays when the shop was closed, a select party played half-penny twenty five card games, or 2d. nap on Sunday evening in the harness maker's workshop. The Lane up as far as the Church was bounded by the high wall of the demesne on one side and a lower boundary wall on the other side. There were a long row of wallnut trees drooping over the top of the demesne wall, and boys used to knock down some of the walinuts with stones or sticks when the nuts were nearly ripe. The Church was fronted with two large double gates and two side gates. Just inside the gates, there were two high bushes of hawthorn, one with white blossoms and the other with red blossorns, and the Graveyard surrounded the Church sides and for a long distance behind the Church. The Church was a simple building with a small spire and steps in front to the organ loft. There were three doors in front. There was a shrubbery of tall cypress trees on one side of the Church outside the Graveyard. On the other side of the Lane, flanking the Church, there was in the demesne, a grove of huge tall elm trees and on their top branches there were big rookeries of crows with up to thirty or forty nests. The trees were very high and higher than the Church. This often reminded. me of the Rookery described in Dickens's David Cooperfield. When in the Church, you could hear the cawing of the crocus as they flew around their nests and in March you could watch them carrying twigs in their bills to repair their nests. Although the elm grove was forbidden ground, we boys often crossed the wall and sometimes we would catch a young crow which fell out of the nest. There was a pathway across this grove to the Parish Priest's house, with a wicker door in the wall near the Church. This was a privilege given by the Colonel, who was a Roman Catholic, to facilitate the Priest coming to say Mass. This pathway was flanked with laburnan, lilac and other ornamental shrubs growing under the elm trees, and a little wood bridle over a small stream before you entered the grounds around the Priest's house. It was a beautiful grove and the ground was all studded with primroses, bluebells and violets. Detached three-bay gable-fronted single-cell Roman Catholic church, c.1830, with single-bay central breakfront having two-stage tower and spire. Three-bay to side elevation of nave. Extended to east, c.1880, with chancel and sacristy. Refenestrated, c.1970. Renovated c.1990. 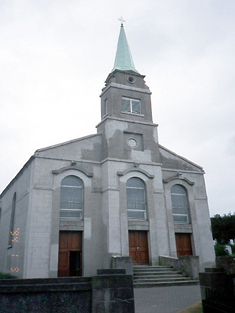 ROOF: Gable-fronted; slate; concrete ridge tiles; concrete coping; cross finials to rear gables; replacement uPVC rainwater goods; copper-clad spire; cross finial. WALLS: Nap rendered, c.1990; ruled and lined; unpainted; nap rendered plait band; granite course and coping; roughcast to sacristy; unpainted. OPENINGS: Square-headed door openings to front elevation with round-headed window openings over, all within nap rendered surrounds; round-headed window openings to side elevations; granite sills; replacement aluminium casement windows, square headed door opening to right side elevation; nap rendered Gibbsian surround; replacement timber panelled doors; square-headed window openings to sacristy; concrete sills; replacement uPVC casement windows; cast-iron grills to ground floor. INTERIOR: Full-height internal space; stone flagged ; timber wainscoting; carved timber stations; stained glass window; carved timber balcony over entrance over cast-iron pillars; plaster cornice; flat compartmentalised plaster ceiling; moulded round-headed arch over marble columns; carved marble altar rail; marble altar and side altars; decorative reredos; various cut-stone memorials and plaster statuary.